The Alliance for Food Sovereignty in Africa is an alliance of civil society and farmer organizations across Africa dedicated to promoting a strong, united voice of African-driven solutions of food sovereignty, agroecology, and social justice. 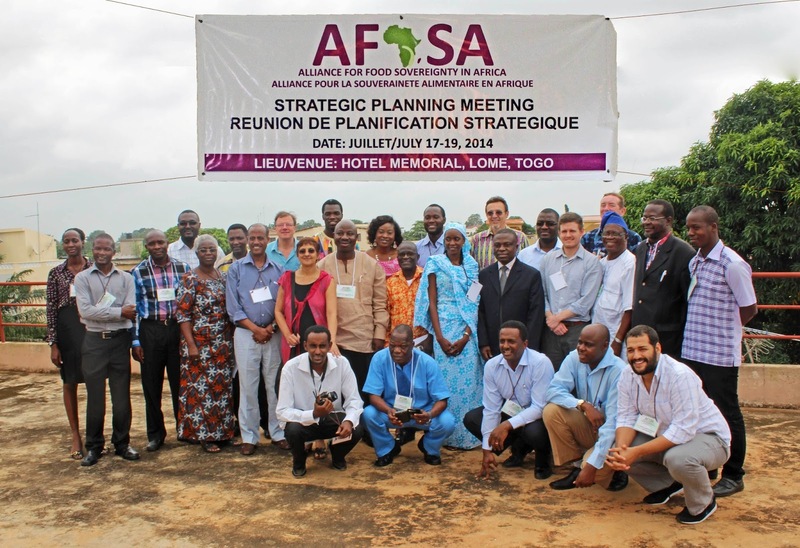 The Alliance for Food Sovereignty in Africa (AFSA) works to influence policy in Africa around community rights, family farming, promotion of traditional knowledge, the environment and natural resource management. This Saturday, October 15th, AFSA, along with the US-based Farmworkers Association of Florida, will be awarded the 2016 Food Sovereignty Prize by the US Food Sovereignty Alliance. AFSA will be honored for its work in building a strong movement of people directly impacted by expanding corporate agriculture, including land and water grabs, and advancing food production systems controlled by food producers, making nutritious food produced in harmony with planet available to everyone. Donors and governments sidelining sustainable farming methods in the new ‘Green Revolution’ in Africa, Christian Aid warns in new report. This report argues that smallholder farmers in Africa and Asia can improve agricultural productivity, food security and livelihoods by adopting sustainable approaches that utilize resource-conserving technologies and that draw upon their own knowledge. Many thousands of communities in countries such as India, Cambodia, the Philippines, Burkina Faso, Zimbabwe and Kenya are already benefiting from sustainable farming but they need more support and, above all, these approaches need to be scaled up. Seventy per cent of the world’s nearly 1 billion hungry people are smallholder farmers and the rural landless. Marginalised smallholder farmers have long been locked in a cycle of low productivity, lack of assets and services and weak market power. In addition, they face a number of newer challenges. Many crop and livestock producers are deeply vulnerable to the effects of climate change. Land degradation and groundwater depletion are increasingly posing a threat to food security and the livelihoods of rural people. Meanwhile, scope to expand agricultural production into new lands is increasingly limited, and competition for existing farmland is increasing too: from foreign investors, industry and urban developers. Rising food prices since the onset of the global food crisis of 2007 to 2008 have posed a further challenge to smallholder farmers who tend to be net food buyers and who also have to meet the costs of rising fertiliser prices. This report asks the question: what kind of agriculture can address poverty and hunger in a world in which the climate is changing, food demand is growing and land, soil and water resources are increasingly under pressure; and in a way that preserves the natural resource base for future generations? In recognition of the challenges facing agriculture, donors and governments have in recent years made welcome new political and financial commitments to smallholder farming, especially in Africa. However, as this report outlines, the solutions for Africa advocated by donors, governments and the initiatives of private foundations have tended to centre around the promotion of synthetic fertilizers and pesticides, which are costly for farmers and very often resourcedepleting. This drive for a new ‘Green Revolution’ for Africa has tended to sideline more sustainable, farmer led approaches. For example, recent input-subsidy programmes in Africa have brought significant short-term benefits in certain cases, but they are looking increasingly unsustainable and risk sidelining investment in greener alternatives. And our research identifies concerns that the agro-dealer networks funded by the Alliance for a Green Revolution in Africa (AGRA) are selling ever more quantities of agro-chemicals to farmers, thus marginalising the space for alternative approaches that are more sustainable. The experience of Asia’s Green Revolution holds some very important lessons for policy-makers globally. There is no denying its achievement in lifting yields and reducing hunger, especially from the 1960s to 1980s. But this process of change began to stall in the 1990s and this is posing major challenges for Asian governments today. One cause is the heavy burden on the natural resource base of the widely-adopted, intensive monocropping system. Soil degradation has meant farmers have had to increase the quantity of fertiliser used in order to maintain their yields. This has in turn affected their profit margins and is one factor behind increasing levels of farmer debt. There have been a range of other serious consequences of the Asian Green Revolution (for example, the loss of on-farm biodiversity, social inequalities, and the dangerous effects of pesticides on the health of farmworkers), which should give governments more than a pause for thought. We define sustainable agriculture as a way of producing food that balances the economic, social and environmental aspects of farming. It is an approach that minimizes or avoids chemical inputs, uses resource-conserving technologies and materials available on the farm, and draws and builds upon the capacity of farmers and community organisations. These principles are already being successfully adopted by farming communities in Asia and Africa, including with the support of Christian Aid partners. 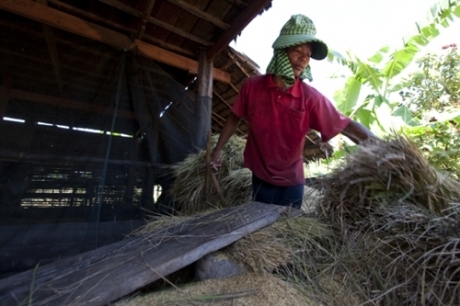 Cambodia, the adoption of new growing techniques for rice, which minimise the use of agro-chemicals and water (known as the ‘system of rice intensification’) has helped increase yields for farmers from an average of 2.5 tonnes per hectare to 3.7 tonnes per hectare. In Zimbabwe, Christian Aid partners ZimPro and the Dabane Trust have assisted over 3,000 households to adopt conservation agriculture. This enabled farmers to increase significantly their yields of sorghum, millet and maize – helping to improve household food security. And in other countries, farmers have been able to cut back on pesticide use by adopting natural methods of tackling pests. This has delivered both income and health benefits. However, these approaches remain severely under-supported. To scale them up governments and donors need to significantly re-balance their current focus on quick-fix, external input intensive ‘solutions’, towards a much greater support for sustainable, agro-ecological approaches. This should come through a re-balancing of government subsidies towards resource-conserving technologies and by building these approaches into revived public research and extension programmes that place smallholder farmers, their associations and networks at the centre of decisionmaking. National seed laws should primarily focus on promoting farmers’ rights and access to seeds of their own choosing, be they modern or local seed varieties. They should also enshrine the right of farmers to freely breed, conserve and exchange traditional varieties. Governments will also need to increase poor people’s access to land and smallholders’ security of tenure – both are important pre-requisites for rural food security and the adoption of sustainable agriculture. Governments need to encourage and harness the potential of the private sector to play a role in supporting sustainable farming, while also putting in place appropriate regulations, for example to ensure that private agro-dealers do not replace government extension service as a source of advice on inputs for farmers. This must also be accompanied by initiatives that enable the creation of, and access to, markets that return fair prices for small-scale producers, and global trade policies that safeguard the position of domestic producers in national food systems. Author EditorPosted on November 30, 2011 Categories AGRA WatchTags AGRA, agroecology, Food sovereignty, Green Revolution1 Comment on Donors and governments sidelining sustainable farming methods in the new ‘Green Revolution’ in Africa, Christian Aid warns in new report.